Are you an avid bird watcher, a passionate hunter, a sailor or a boat enthusiast or an all-weather nature lover? Then you will need the best waterproof binoculars to truly enjoy your hobbies. Today, many binoculars manufacturers market their products as waterproof and fog proof, but some are only rated as weatherproof. 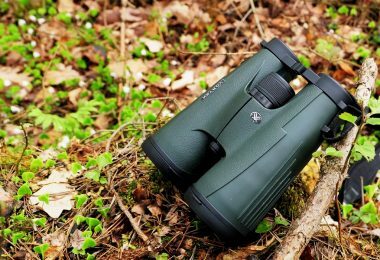 You may get confused by all the different designations and claims, and have hesitations when selecting your next binoculars. Once we go through all the details you’ll find a clear view of a brand-new world of waterproof binoculars. Here we are going to make reasonable and comprehensible explanations of these terms, and we will not bother you with technical terms, but explain the basics and tell you all you need to know about the waterproof binoculars, along with a review of the top rated products of this kind. As with any product a company will try to highlight areas that it feels their product stands out in. The thing is that those might not be the most important areas when it comes to comparing that product with others. In the case of waterproof binoculars, we have listed out a few of the major things that you should be looking into. There is also the marking weatherproof, used to describe binoculars. This term, along with weather protected and water resistant is used in relation to the ability of the binoculars to withstand very little water like light rain, but certainly are not able to withstand any kind of immersion in water. The weatherproof binoculars have a good fit in all critical areas but lack proper O-ring seals to make them truly waterproof. So when selecting binoculars that are going to be exposed to the elements, it is very important that they are rated completely waterproof. The magnification power means how much closer the object seen through the binoculars will appear. 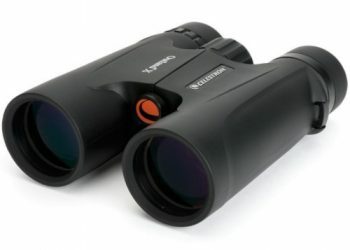 Binoculars with 7x magnification power will show the object seven times closer than it actually is. The objective lens is measured in millimetres, and shows how much light will enter the binoculars – the larger the diameter, the brighter the image. These two numbers are the ones you normally see as part of the binoculars name, such as 7×42. The portion of the landscape seen through the binoculars is the field of view. The field of view depends on the magnification and design of the lenses, so the higher the magnification, the narrower the field of view. A wide field of view is much better for activities like hunting where you are scanning a wide area. On the other hand a narrower field of view is preferred for observation, such as bird watching. There are two basic designs of prism systems in binoculars: the Porro prism and the roof prism system. Both have their merits and downsides, and there is no uniquely better choice as it depends on the intended use and budget. In a roof prism design the light will pass straight through the lens to the prism to your eye. This means a straight binocular set. For a Porro prism the objective lens and the viewing lens are offset. The prism passes the light around the turns. The lenses are usually made of various types of glass and are prone to reflect the light. To remedy this and ensure the maximum amount of light passes the binoculars, the manufacturers coat the lenses with appropriate coatings. The number of layers and types of coatings depends on the quality of the binoculars and the price paid – the more expensive ones have a higher-quality, multi-layered coatings. You will also want to consider if the lenses are coated on both sides (the air side and the internal side). The distance between the eye of the user and the binoculars where the user can see the whole image in focus. The eye relief is important for people with damaged eyesight and eyeglass wearers. This is remedied by implementing twist eyecups that can go up and down, giving just enough space for comfortable viewing. If you don’t wear corrective lens then eye relief distance becomes a person preference. On the other hand, if you do you will want to look for an eye relief of at least 13 mm. This gives you enough space to have your glasses and still get a full view through the binoculars. Almost all binoculars have some kind of coating on the body. This coating is usually some kind of rubber or rubberized plastic and it enables secure, no-slip grip and in some models even shock absorption. The extra grip comes in extra handy when you are looking at a waterproof set of binoculars. Some sets out there have a coating that can cause the binoculars to float as well. This is a useful plus if you will be out in deeper waters. Above we have outlined the major features of binoculars and explained the waterproof function of a binocular. Below we are going to make a comprehensible review of the top rated best waterproof binoculars on the market today that fit every need and budget. Specific features: Fully waterproof and fog proof, float in water, military standards of build, built-in compass, built-in rangefinder, fully multi-coated lenses, tripod adjustable. Best use: Marine use, water sports, fishing, bird watching, hunting. 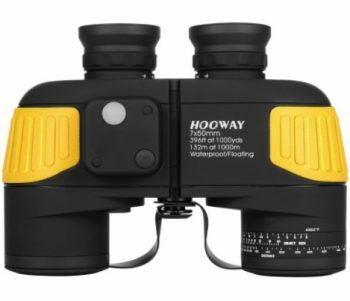 Description: The Hooway 7×50 Military-Marine Binoculars is an excellent choice for waterproof binoculars for those days when it rains and you feel like exploring nature. 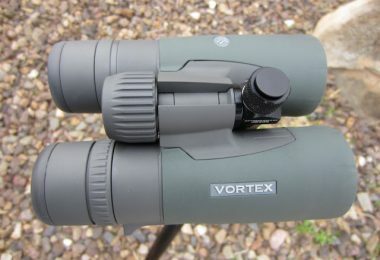 The 7x magnification power and the large 50 mm objective lens make this a very suitable choice for various applications. The prism is Porro, made from high-quality BaK-4 prism glass. The lenses are fully multi-coated to ensure the maximum amount of light passes and you get a bright, clear image. The field of view is 396 feet over 1,000 yards. The exit pupil is 6.8 mm, which means that the image you see will have plenty of brightness and you can use them even in low light conditions. There is the option to adjust individual eyepiece clarity and adjust to individual diopter on both eyepieces. The eye relief is 22 mm, and the eyecups fold down to accommodate people with eyeglasses. 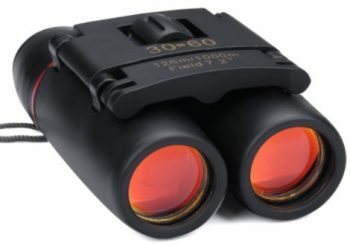 These binoculars have the built-in compass for determining the location that can be illuminated. This, however, requires the use of batteries which are provided in the pack. There is also a built-in rangefinder through which the user can determine the distance and size of the objects. Both of these are only shown on the right side. The Hooway 7×50 Military-Marine Binoculars are made according to military standards, and the body is coated with a non-slip shock-absorbing coating that ensures a secure grip. It is also tripod adjustable, the tripod adapter is at the front of the hinge and provides stability in use. 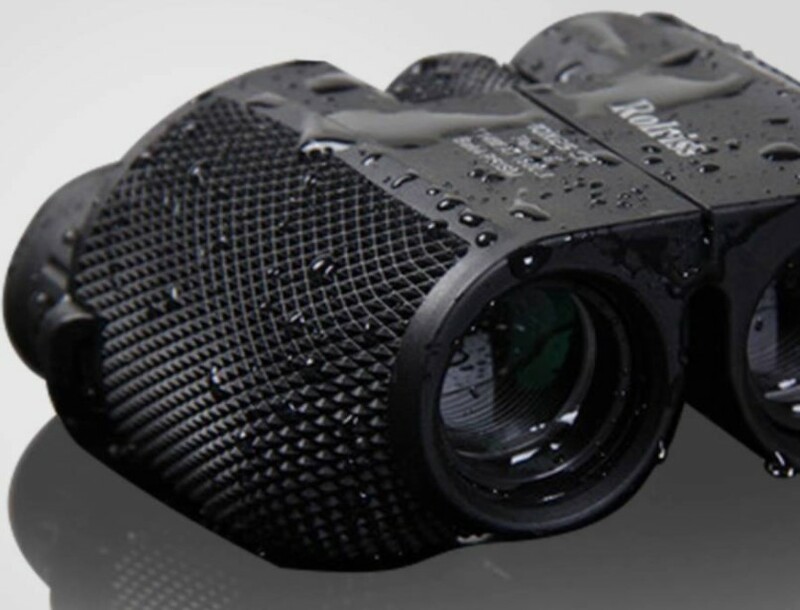 This binocular is waterproof and fog proof. It is rated as floating, which means that you will not lose it if it accidentally gets thrown overboard. It comes with all the necessary amenities: a rain guard, a nice carrying bag, lens cleaning cloth and a floating neck strap. 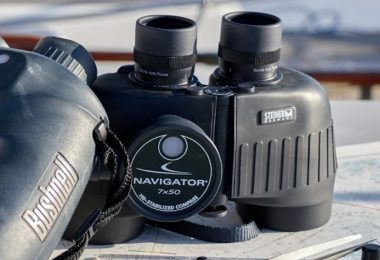 Related: If you are purchasing the Hooway 7×50 Binocular to use on a boat, you can get the Davis Instruments Navigation Rules Cards. These provide a quick advice on safe boating and are made from high strength weatherproof plastic to ensure they stay in place and visible in all weather conditions. Specific features: Fully multi-coated optics, HD performance, large eye relief, waterproof and fog proof performance, amenities included. Best use: Bird watching, hunting, nature observation. 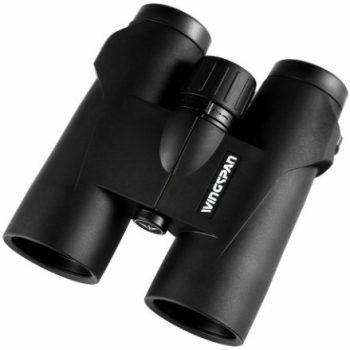 Description: The Wingspan Optics PrecisonView 10×40 Binoculars is a high-quality product. It offers amazing 10 times magnification power over a 42 mm objective lens for clear, bright views. The prisms have a roof design and are made from high-quality BaK-4 prism glass. The lenses feature fully multi-coated surfaces that prevent glare and reduce light scattering while providing crisp, bright, sharp images. There is a wide field of view of 341 feet over 1,000 yards, enabling a panoramic view. The focus is achieved via a central focus knob. The exit pupil is 4.2 mm, giving enough brightness even in low-light conditions. The eye relief is 15.2 mm and can be adjusted via the twist style eyecups. The diopter can be adjusted on the right side lens, from -3 to +3 dpt, while the interpupillary distance is adjustable from 56 to 75 mm. 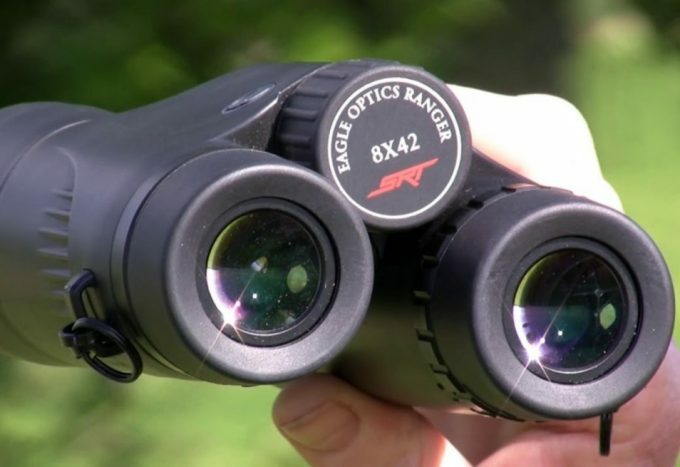 The Wingspan Optics Precisionview 10×42 Binoculars have a nitrogen filled internal atmosphere to prevent fogging, and a very reliable waterproof performance. The body of this binocular is made from lightweight aluminium and has an ergonomic, no-slip rubber exterior. It comes with all the included amenities: a neck strap, carry case, eyepiece and lens protective caps and a microfiber lens cleaning cloth and a Premium Limited Lifetime Warranty. Related: If you are purchasing a Wingspan Optics PrecisonView 10×40 Binoculars, as these are a great bird watching binoculars, you can also treat yourself with a bird watching guide, like the National Geographic Backyard Guide to the Birds of North America. This is an amazing guide from a trusted source that is sure to be handy either in the backyard or deep in the forest. Specific features: High-quality optical elements, waterproof and fog proof performance, durable, non-slip rubber armour for shock absorption, limited lifetime warranty. Best use: Bird watching, hunting, nature exploration. 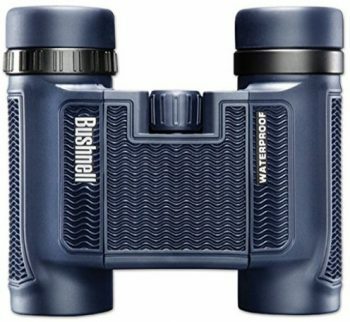 Description: The Bushnell H2O Binoculars are a great option for good quality all-purpose binoculars. This model is one of the most sold Bushnell products. The 10x magnification power and the large 42 mm objective lens make it a versatile binocular for many purposes. The prisms have roof design and are made from BaK – 4 prism glass for bright, crisp images. The lenses are multi-coated for increased light transmission and decreased light scattering. The focusing is achieved through a large central focus knob for easy and fast adjustment. The eye relief is 17 mm, and the eyecups are twist style, long enough to accommodate eyeglass wearers. The close focus is 12 feet, and the field of view is 305 feet over 1,000 yards. This binocular is fully waterproof, with O – ring seals that protect it against water and dust entering the binocular, the internal atmosphere is filled with nitrogen for fog proof performance. The exterior is coated in rubber armour for a soft texture grip for absorbing shock and secure, no-slip grip. The Bushnell H2O 10×42 Binoculars are tripod adjustable and come with protective lens caps, rain guard, simple neck strap and a nice carrying case and are covered by Bushnell’s Limited Lifetime Warranty. Related: When thinking about getting the Bushnell H2O 10×42 Binoculars and you want to carry them around your neck for extended periods of time, then a proper neck strap like the OP/TECH USA E-Z Comfort Strap would be a good option for you. This will help carry the wieght and maintain your comfort while doing so. Specific features: Porro prism design, multi-coated lenses, no-slip grip rubber armoured body, waterproof, fog proof, dustproof, amenities included. Best use: Bird watching, camping, hunting, outdoor activities. 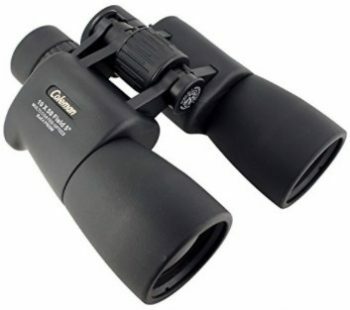 Description: The Coleman 10×50 Signature Binoculars are a nice choice for waterproof, all-purpose binoculars. They come with a 10x magnification power and a large 50 mm objective lens, this enables great views even in more low-light conditions. These binoculars have a Porro prism design, made from BaK-7 glass. The lenses are multi-coated for sharp, clean, bright images. The exit pupil is 5 mm, enabling the use in various light conditions. There is a generous eye relief that also fits eyeglass wearers. The body is coated in a non-slip rubber armour that provides a firm grip and some shock absorption. 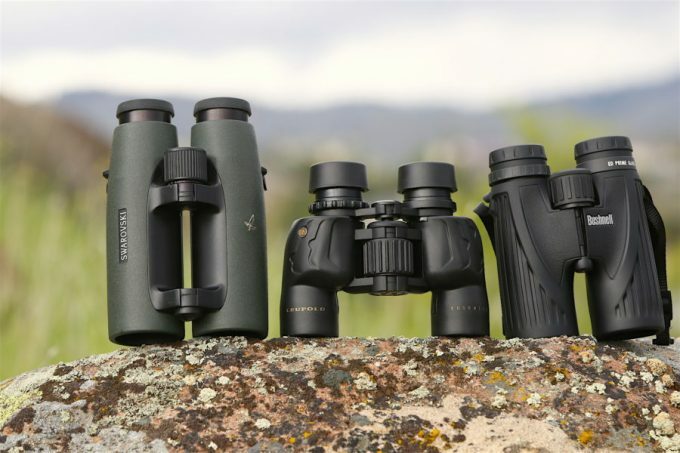 The Coleman 10×50 Signature Binoculars are indeed waterproof, fog proof and dustproof due to the O-ring seals on all the key areas. They are tripod adjustable and come with a carry case, protective caps and a neck strap. Related: When purchasing a pair of the Coleman 10×50 Signature Binoculars and plan to use them for bird watching, it is good to get a book guide to birds like the National Geographic Field Guide to the Birds of North America, 7th Edition. This is a serious book for those birders who really want to step up their identification game. Specific features: BaK-4 prisms, multi-coated optical elements, waterproof, fog proof, non-slip rubber armour, limited lifetime warranty. Best use: Bird watching, hiking, general sightseeing. Description: The Bushnell 138005 H2O Binoculars are a great choice for a waterproof, compact binoculars. These have nice 8x magnification power with 25 mm objective lens. This makes the exit pupil size 3.1 mm, which is an excellent size for compact binoculars for various applications. The prisms are roof design made from high-quality BaK-4 prism glass. The lenses are multi-coated for increased light transmission and crisp, clear images. The close focus distance is 15 feet and the eye relief is 12 mm which can be adjusted via the twist-up eyecups. The focus is achieved by a central focus knob. 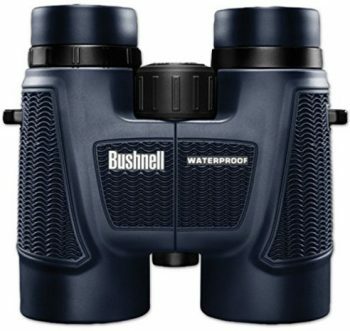 This Bushnell binocular is completely waterproof and fog proof, with O-ring seals on all the critical areas. There is a non-slip soft textured rubber coating on the outside of the body, providing a firm grip and shock absorbing properties. It comes with a carry case, neck strap and is covered by the Limited Lifetime Warranty. Related: You will probably get the Bushnell 138005 H2O Binoculars for hiking, and you will need a nice backpack for the same purpose. A nice choice is the Outlander Lightweight Travel Hiking Backpack. It can hold 20 liters of volume, is waterproof and durable, and comes in different colors to your liking. Specific features: Lightweight compact body, high 10x magnification, fully multi-coated lenses, waterproof performance. Best use: Bird watching, hunting, sporting events, hiking. Description: The Aurosports 10×25 Folding Binoculars are a great little compact binocular with good performance. The high 10x magnification power and the 25 mm objective lens enable good views of the desired objects. These binoculars have nice fully multi-coated optical elements that offer excellent, clear, crisp views. They also have a very reasonable field of view for compact binoculars of 362 feet over 1,000 yards. The eyecups are twisted style, accommodating both people with or without eyeglasses. The exit pupil size is just 2.5 mm, but these also have a weak light night vision that enables their use in low light conditions, but not in the complete dark. The close focus distance is 9 feet, and the focus is achieved via a large central focus knob. They are waterproof and the body is coated with a hyper-durable anti-slip grip coating. These can be folded for easy carrying and they come with a carry case, simple neck strap and a cleaning cloth. Related: When considering getting a pair of the Aurosports 10×25 Folding Binoculars, you should consider getting a similar pair of compact binoculars like the Aurosports 30×60 Folding Binoculars. You can carry these binoculars in your pocket and use it in sporting events when hiking or general sightseeing. Specific features: Fully multi-coated optics, BaK-4 roof prism system, waterproof and fog proof performance, rubber armoured body, neoprene carry case and neck strap. Best use: Bird watching, hunting, outdoor activities. 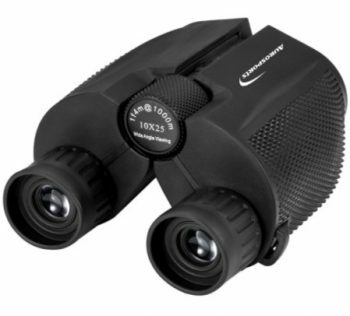 Description: The Celestron 71347 Outland X 10×42 Binoculars are a great choice for your next outdoor adventure. They have great 10x magnification with 42 mm objective lens, allowing their use in more low light conditions. They feature roof prisms made from high-quality BaK-4 prism glass. The lenses are fully multi-coated providing crisp, clear, bright images with decreased light scattering. The field of view is 294 feet over 1,000 yards, and the close focus distance is 14 feet. The eye relief is 14 mm and can be adjusted via the twist eyecups. There is also diopter adjustment ring, and the interpupillary distance can be adjusted between 56 and 74 mm. These binoculars are waterproof and have a durable, non-slip rubber coating on the outside of the body. They come with all the amenities like a neck strap, carry case protective lens covers, the lens covers can be semi-attached to the body so they are not lost. These are tripod adjustable and are covered by the No-Fault Lifetime Warranty. Related: If you plan on getting yourself a pair of the Celestron 71347 Outland X 10×42 Binoculars, and use them for hunting or bird watching, then it is smart to invest in a chest harness like the OP/TECH USA Bino/Cam Harness – Webbing. This fits nicely on your neck and distributes the weight of the binocular, so you use your binoculars or camera and carry it easily and comfortably. Specific features: High magnification, waterproof performance, pocket size body, multi-layer composite red film coating. Best use: Observing sporting events, hiking, surveillance, golfing. Description: The Kimfoxes TIAN – 46 Binoculars is a nice little binocular with amazing magnification bordering on telescope magnification. It is rated as 30x magnification, but it is more in the realm of above 10x. The lenses have red film coatings to improve the quality of the image. They have a nice wide angle of view, the exit pupil size is 2.6 mm; the eye relief is 10 mm and can be adjusted via the adjustable eyecups. The focus is achieved via a large focus wheel that is located on the hinge. 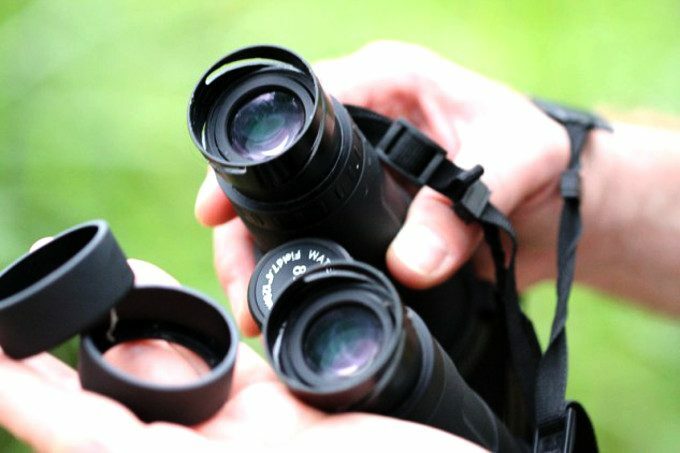 The Kimfoxes TIAN – 46 Binoculars are coated with a non-slip rubber coating for easy gripping, and all the key areas have been sealed with O-ring seals for a waterproof performance. The barrels are mounted on an over-hinge and can be collapsed for compact carrying, and opened according to the user. They come with a carry case, neck strap, cleaning cloth and instruction manual. Related: If you get the Kimfoxes TIAN – 46 Binoculars, then you can treat yourself with a nice little monocular to complete the pocket-sized high-power set. A good choice would be the ARCHEER 16×52 Monocular with day and night dual focus. You can use this in concerts, observing birds, or when travelling. Above we have explained the basics of waterproof binoculars, so you will be familiar with all the details of this term. We have also made a comprehensible review of the top rated waterproof binoculars that fit every need and budget. 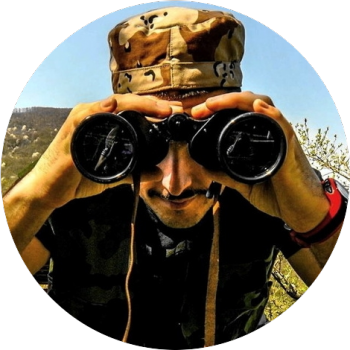 You just need to know the application of the binocular, read through our reviews and choose the one that best fits your needs. Already own waterproof binoculars? Share your experiences and advice in the comments section below.